Unlike some other shaving techniques, straight razor shaving totally removes every strand of hair and leaves the surface smooth and fresh-looking. 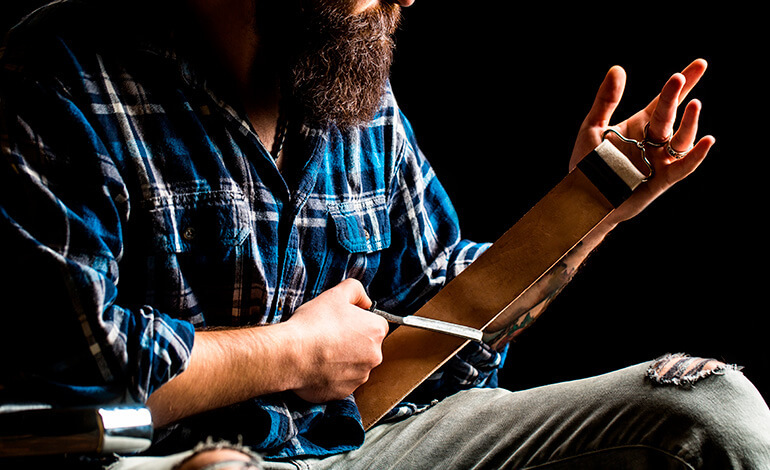 Before you begin to straight shave however, you’ve got to have knowledge of how to sharpen a straight razor; a lack of this knowledge could produce some pretty unsavory results. Since you won’t be changing blades, all you’ve got to do is keep the one that you have sharp and ready to go at any time. Doing this would save you from a number of complications that could arise as a result of using a blunt straight razor. In the next paragraphs, we would be taking a look at everything you need to keep your straight razor sharp and how to do that exactly. These optional materials make your sharpening process a lot easier and efficient but they are not the essentials that you need. However, it is advisable that you have them around and within easy reach. A Honing stone is simply a whetstone along which you sharpen your razor’s edge. A fine-grit stone makes for a very effective tool to maintain your razor’s sharpness and is also the best when it comes to polishing. Furthermore, it is advisable that you get a large stone to allow much room for maneuvering and this also makes sharpening a lot easier. The Hone is a must-have for every straight razor owner simply due to the fact that this is what maintains your blade for you. Without a hone, your straight razor would become useless as a result of bluntness after a while. Furthermore, using a blunt razor could provide certain results which you would definitely not like therefore this is one tool you need to have around. A strop simply refers to a surface that comes into play after the hone has been used for sharpening. The main function of the strop is to keep the edge polished and remove any traces of sediments that might have been left behind after the honing. Usually, strops are made of leather although there are some that are made from other materials. The suede and smooth leathers which are known in technical terms as the flesh side and grain side are used in the stropping process. 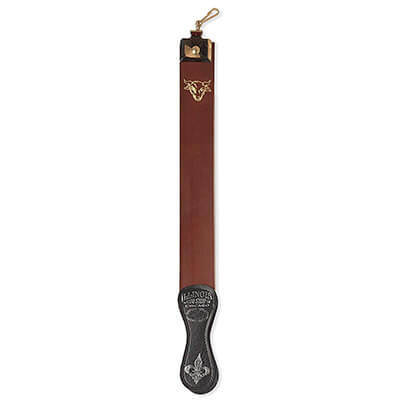 In order to mount them, you could make use of a rigid base such as attaching leather on wood paddle strop or you could consider flexibility such as a leather and linen razor strop. Usually, the option of honing or stropping depends on how blunt your blade has become. If you are in a hurry but you need to shave, stropping would take less time and you would also have your blade sharp enough to have a satisfactory shave. However, if your blade has become really blunt, then honing is the process to make it through first. You can then continue stropping whenever you want to make use of the blade in order to maintain the sharpness for a long time. There are a number of methods that can be applied when it comes to honing. However, the method used usually depends on how blunt the blade is. Basic honing only requires that you make use of honing paste along with a strop while advanced honing would involve the use of honing stones. Most of the razors available in the market are hollow-ground razors. This simply implies that the razor’s sides have a concave shape which effectively makes them a lot smoother and sharper. 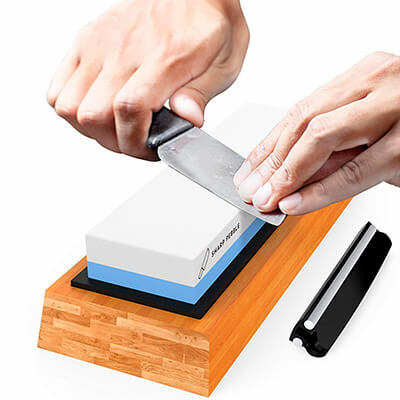 Also, the blade usually comes with an angle at which to sharpen which is determined by the manufacturer; taking note of this angle make sharpening faster and easier. Upon placing the razor flat against the stone, you get the angle determined by the manufacturer thanks to the fact that the edge is thinner than the spine. Furthermore, placing the razor flat on the stone ensures consistency which is highly essential in sharpening your straight razor. After placing the razor flat on the stone, ensure that every move is done along the stone in an even manner. Pull the razor towards you at a slight angle to ensure that the blade’s entire length moves across the stone completely. Also, ensure that you keep the razor’s edge flat on the stone while avoiding application of additional pressure- leave the grit of the stone and the razor’s weight to do the job. At the end of each stroke, invert the razor while making sure the edge is not drawn across the stone since this could blunt the edge you just formed. Making use of the “X-pattern” easily guides your hands. In order to get the entire length of your razor sharpened while minimizing the amount of stress you would have to undergo, slow and light strokes are your surest bet. Making use of light strokes in a slow manner would effectively ensure that the razor stays in contact with the stone up until the end of the stroke. This kind of stroke sharpens the entire length of the razor up to the edge. When you add pressure, you increase your chances of missing the bevel’s head. To end up with very sharp and smooth edges, you need to take your time when sharpening. Just like a lot of other things, to get the best out of your razor, you need to sharpen optimally. Over-sharpening would give you a very uncomfortable shave just like under-sharpening would. Also, when you over-sharpen, you increase the likelihood of getting yourself injured when shaving. In summary, it does not allow for a great shaving experience. Therefore, you need to check from time to time to ensure that you are still on track. Asides from the possibility of injury, a very sharp straight razor could lead to some really nasty razor burn which could disfigure your face. Therefore, ensure that you apply moderation. The major essence of stropping your straight razor is that it aligns the edge of the razor’s blade. This is something you have to do before each shave in order to have a great experience. Every time you strop your blade before use, you feel the results- making use of a sharp razor directly implies quality results. A strop consists of two components – a leather side and a fabric side. The fabric side does the duty of removing anything that could cause damage to the leather such as metal fragments, soap, etc. While the leather, which usually has a smoother surface does the main job the razor’s surface. 1. Hang up one end of the strop and hold it taut in your direction. In order to make the stropping simple and reduce the likelihood of cutting into the leather, you have to be conscious of your positioning. Typically, you should incline the strop in such a manner that it points towards you in a downward direction at about a 45-degree angle. This is highly advisable especially when if you’re just starting to strop. In actual fact, the location of the anchor point is not a very big deal but you’ve got to ensure that it doesn’t move when you’re stropping. Examples of great anchors include towel bars and door handles. Also, if you’re making use of a loom strop or paddle, you would need to place one end on a firm surface. Then lift while holding the handle so that the strop ends up at about an angle of 30°. Here is a pictorial denotation of this. 2. Slide the razor along the strop, in the direction opposite from you. The spine of the best straight razor should be pointing in the opposite direction from you while the edge should be pointed towards you. Also, you should keep the blade slightly elevated such that the edge comes in contact with the strop at a slight angle. After doing this, push the razor away from your direction while applying very light pressure. Push the razor until the very end of the strop in order to cover the blade. 3. Turn the razor over at the end of the strop. From step two above, once you have gotten to the end of the strop, turn the razor over such that the spine now points in your direction. Also, ensure that the blade remains in contact with the strop when rolling the razor between your fingers during the flipping process. Maintaining contact between the strop and the blade might be quite technical but with practice, you would get used to it. Furthermore, this makes your stropping a lot more efficient and effective. Here’s one of the reasons to always turn your blade. 4. Bring the razor toward you. Pull the razor downwards to tell bottom of the strop spine first. While doing this, ensure that you do not apply any more pressure than you did when you were moving the blade up the strop. Also, maintain that slight angle mentioned earlier with the strop, so the edge and the leather stay in contact all the way down. Upon getting to the bottom, flip the razor and bring it back up along the leather. Repeat this process for about 10-15 more times. In addition, if you pass the blade along the strop’s fabric side first, you would use this same process and also repeat 10-15 times. 5. Use an X pattern on two inch (5cm) strops. Just like when honing, the X-pattern is also applicable to stropping. This is mainly due to the fact that the models of strops available aren’t wide enough to cover the entire length of the razor’s blade. This implies that when sliding your blade up and down the strop, you would also need to slide it sideways so the strop covers the entire blade length. The easiest way to do this involves moving the blade in the right direction when moving it away from you then towards the left when you’re pulling it back towards you. Now that you’ve gone through the entire article, don’t forget that your blade goes a long way in determining your overall appearance. Recall that the importance of facial appearance cannot be overestimated. Furthermore, keeping your blade sharp and in prime condition always, saves you stress and time and also ensures that you look fresh and neat always. Recall also that a blunt blade and an over-sharpened blade would have about the same effect on your face; causing you discomfort while shaving. In essence, maintaining your blade is proportional to how much satisfaction you derive from it. I look forward to reading all your thoughts in the comments section and don’t forget to share if you liked the article.